Founded in 1875 as the American Forestry Association (AFA), American Forests is the oldest national conservation organization in the U.S.
American Forests was established at a pivotal time in the nation’s history, barely a decade after the Civil War and during a period of tremendous development and industrial expansion. Forests were being cut down at an alarming rate to make way for new farms, towns and railways, and timber barons were exploiting what then seemed like an inexhaustible resource. The AFA proposed a different way. The organization was not opposed to progress, but advocated for a careful and science-based strategy to manage and conserve our forestlands for generations to come. helped pioneer and advance the field of urban forestry. We have also funded more than 1,000 forest restoration projects in every state in the nation, planted nearly 60 million trees, and helped expand tree canopy in dozens of major cities and urban areas. Today, we continue to be a leading force for forest conservation in the United States, focused on climate change, water availability, wildlife habitat and biodiversity, and the social benefits forests provide. 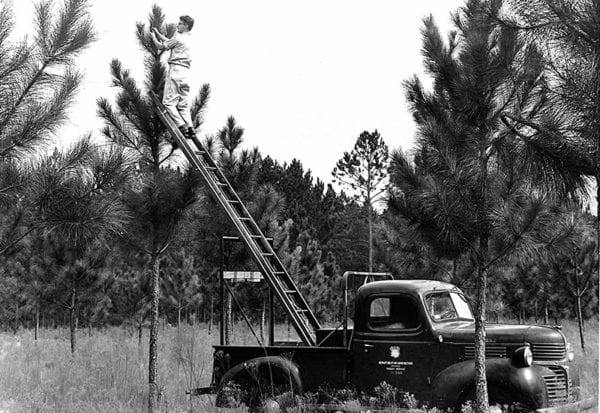 Led by physician and horticulturist Dr. John Aston Warder, concerned citizens founded the American Forestry Association (now American Forests) in response to rapid and wasteful postwar development and intense wildfires. As a result of AFA/American Forests’ example and influence, Minnesota creates its own state forestry association and is followed by 18 other states in the coming decades. 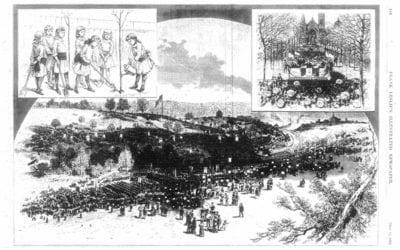 The first American Forestry Congress is held in Cincinnati’s Eden Park in conjunction with the first National Arbor Day tree planting and is attended by 50,000 people. AFA/American Forests publishes a paper by Ellen Call Long titled “Notes on Some of the Forest Features of Florida.” The paper would have a seminal impact on the introduction of prescribed burning, a key practice used to improve forest resilience and limit major wildfires. After introducing the idea four years earlier, AFA/American Forests successfully advocates for a bill that grants the president power to set aside forest reserves. That same year, President Harrison proclaims nearly 13 million acres of forest reserves. 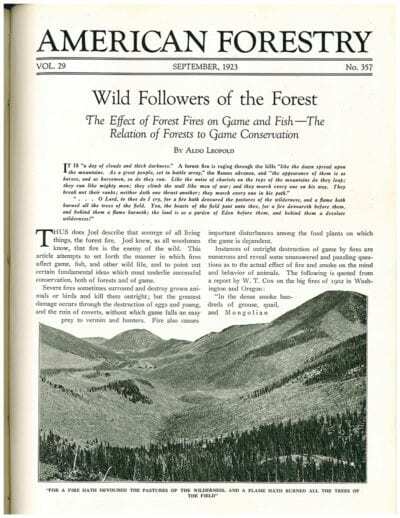 American Forests magazine, the nation’s first conservation-focused periodical, debuts. AFA/American Forests advocates for the administration and protection of forest reserves, resulting in the successful passage of the Forest Reserve Act. President Theodore Roosevelt addresses an AFA/American Forests Congress. Proceedings (Archives.org) of the American forest congress held at Washington, D. C., January 2 to 6, 1905. AFA/American Forests supports the creation of our first national parks. AFA/American Forests plays a pivotal role in the passage of the Weeks Act, allowing for acquisition of forest reserves in the eastern U.S. to protect watersheds. This marks the first time in history that the federal government purchased land specifically in recognition of its ecological services. 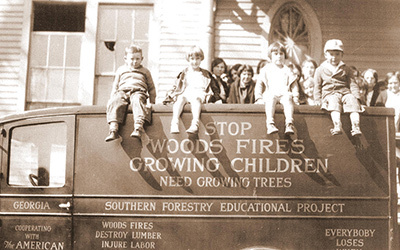 Following World War I, AFA/American Forests launches memorial tree planting campaigns to plant trees in cities across America. 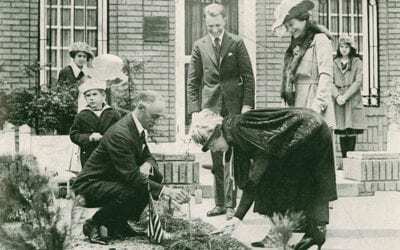 First Lady Florence Harding plants the first memorial tree in Washington, D.C. This campaign was among American Forests’ earliest efforts to expand tree canopy in urban areas. AFA/American Forests publishes the first of many articles by Aldo Leopold, one of the nation’s most revered nature writers and a man considered by many to be the father of wildlife ecology. AFA/American Forests donates the first live Christmas tree to the White House under President Calvin Coolidge’s administration, beginning a national tradition that continues to this day. AFA/American Forests creates the Dixie Crusaders, a highly effective three-year campaign to educate Southerners about human-caused wildfire. As part of the campaign, a caravan of trucks traveled 30,000 miles through the Deep South holding rallies, distributing literature and showing self-produced movies (at the dawn of the film age) to some three million people. AFA/American Forests advocacy efforts lead to the protection of the Florida Everglades, Grand Tetons, Olympic Mountains and other natural areas. 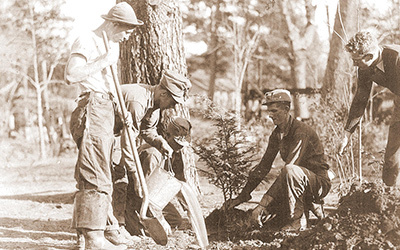 AFA/American Forests works with President Franklin D. Roosevelt to create Civilian Conservation Corps. AFA/American Forests launches Trail Riders of the Wilderness, one of the first ecotourism programs in the U.S. Legendary artist and illustrator James Montgomery Flagg, who famously created the Uncle Sam “I Want You” recruitment poster, works with AFA/American Forests to create a national forest fire prevention campaign. The National Register of Big Trees is established, documenting the largest living tree of each species in the U.S. The Register still exists after more than 75 years. AFA/American Forests is presented a Smokey Bear statuette by the U.S. Forest Service in recognition of its years of forest fire advocacy and education work. With the help of AFA/American Forests, a new task force is formed to create a national program for wildfire control. President Nixon signs laws that authorize the creation of four new national parks and AFA/American Forests advocates for a half a dozen additional pending national parks in bills in Congress. AFA/American Forests begins a campaign fighting against privatization of federal public lands. 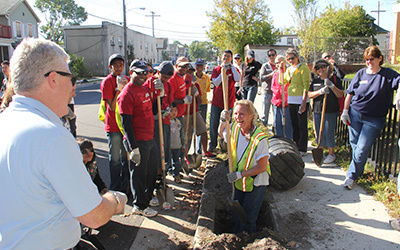 Although an advocate for urban forestry for decades, AFA/American Forests launches its first formal urban forestry program and convenes the first National Urban Forest Conference. After years of advocacy by AFA/American Forests, President Ronald Reagan signs the 1985 Farm Bill, including the new Conservation Reserve program, into law. AFA/American Forests creates the National Urban Forestry Council. AFA/American Forests provides congressional testimony and works successfully to gain widespread support for improved research efforts on the impact of air pollution on forests. AFA/American Forests launches the Global ReLeaf program, planting millions of trees to restore forest ecosystems both in the U.S. and around the world. After decades of advocacy and policy work, AFA/American Forests wins the battle to convince Congress to pass a national urban forestry policy. The first Global ReLeaf forest is established in Au Sable, Michigan. 23,000 jack pines are planted to expand habitat for the endangered Kirtland’s warbler. Christopher Reeve stars in Global ReLeaf PSA’s on the Discovery Channel. 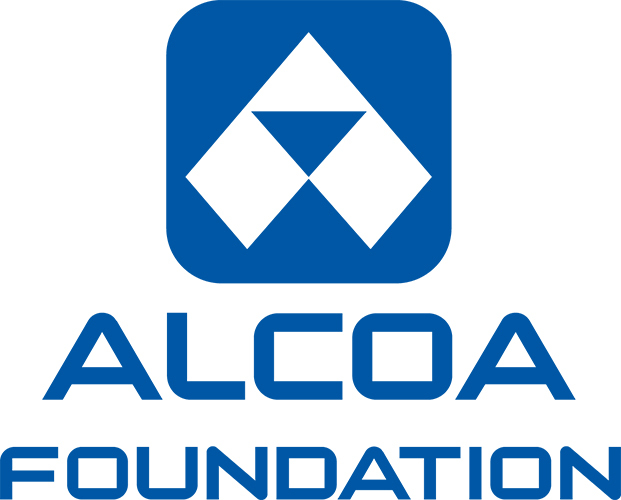 The first international Global ReLeaf project is funded in Hungary. AFA/American Forests creates the Forest Policy Center. Global ReLeaf is awarded the President’s Citation for Innovation. AFA/American Forests advocates for a compromise approach to the spotted owl and old-growth conservation movement in the Pacific Northwest, combining both habitat protection and sustainable economic development. The American Forestry Association officially changes its name to American Forests, focusing on its long legacy as a forest conservation leader. American Forests is asked to draft legislation for a forest health initiative based on the existing National Forest Health Act. The forest health initiative launches. American Forests develops a GIS program to map and measure city tree canopy cover. American Forests introduces CITYGreen software to analyze the environmental and economic benefits of urban tree canopies and green spaces. The CITYGreen program produces its first Regional Ecosystem Analysis using satellite imagery to demonstrate canopy loss in Atlanta. 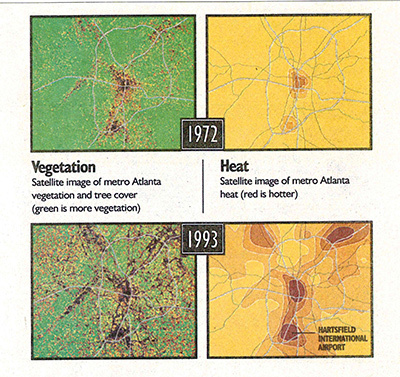 The study, which showed that Atlanta’s urban tree canopy had declined by 65 percent between 1972 and 1993, made the front page of the Atlanta Constitution. American Forests premieres a public television documentary entitled Silent Witnesses: America’s Historic Trees, narrated by actor James Whitmore. Global ReLeaf plants its 10 millionth tree. American Forests partners with the White House to plant Millennium Groves in every state and territory. It also announces a National Policy Agenda for Ecosystem Restoration and Maintenance for the 21st century. U.S. News & World Report runs a story on American Forests’ CITYGreen work, titled: “A Pixel is Worth a Thousand Words: Satellite Images Reveal Startling Tree Loss in America’s Cities.” Similar headlines appear across the U.S. as CITYgreen studies are published in other major cities. The Trees for Tigers initiative is introduced to help save Siberian tigers from extinction. American Forests plants Freedom Trees, Patriot Trees and Memorial Trees to honor victims and heroes of 9/11. Actor Val Kilmer joins American Forests to plant 20 millionth tree in Santa Fe, New Mexico. Congress passes the Healthy Forests Restoration Act of 2003, which included several policies developed and advanced by American Forests. A Katrina ReLeaf Fund is established to restore tree cover to areas deforested by Hurricanes Katrina and Rita. After a year of advocacy by American Forests, the Federal Land Assistance, Management, and Enhancement (FLAME) Act to establish a federal emergency fund for the suppression of severe wildfires is signed into law on October 30. 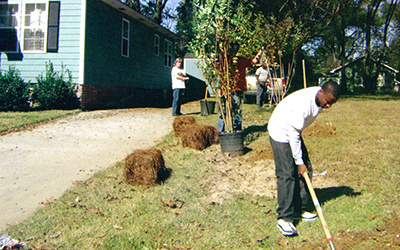 American Forests joins Oprah’s Angel Network to plant trees around Habitat for Humanity for those displaced by Hurricanes Katrina and Rita. American Forests becomes Chair of the Sustainable Urban Forests Coalition (SUFC) Policy Working Group. SUFC advocates for legislation relating to urban forestry and green infrastructure. Jack Daniels issues a commemorative American Forests bottle. American Forests launches the Endangered Western Forests initiative — focusing, in its first stage, on the dangers facing the high-elevation whitebark pine of the Greater Yellowstone Area. American Forests publishes award-winning “Urban Forests Case Studies: Challenges Potential and Success in a Dozen Cities,” a major study of best practices in urban forests in the U.S.
American Forests launches Community ReLeaf, a program dedicated to expanding urban tree canopy in cities across the U.S. through building partnerships, conducting tree canopy assessments, funding demonstration projects, and advancing public support. Working with a blue-ribbon panel of experts, American Forests surveyed the 50 most populous U.S. cities on the health and maintenance of their urban forests and named the 10 Best Cities for Urban Forests in the U.S. The cities were Austin, Charlotte, Denver, Milwaukee, Minneapolis, New York, Portland, Sacramento, Seattle and Washington, D.C.
American Forests partners with Eddie Bauer and actor Ryan Reynolds to plant our 50 millionth Global ReLeaf tree and complete our 1,000th forest restoration project. American Forests launches the Wildlands for Wildlife initiative to create a more comprehensive approach for our efforts to protect habitat for endangered and threatened species. Key landscapes include Texas thornscrub forests in the Lower Rio Grande Valley, home of the endangered ocelot and hundreds of bird and butterfly species; jack pine forests in the Northern Great Lakes, home of the endangered Kirtland’s warbler; and whitebark pine forests in the Northern Rockies and Cascades, home of the grizzly bear and other iconic species. American Forests assumes leadership of the Forest-Climate Working Group and launches an ambitious new forest-climate strategy. After five years of advocacy, Congress passes a fix to the way wildfires are funded through the U.S. Forest Service budget. American Forests was a leader in the coalition that tirelessly worked on this effort to ensure firefighting is adequately funded, but not at the expense of all other priorities of the U.S. Forest Service, including forest restoration, managing urban forests, and replanting our national forests.